Really quick post on issue experienced recently. We were trying to build some Lenovo T470Ps and one was exhibiting this error just before the task sequence was to start and failed as a result before we even got off the ground. The error translates to The system cannot find the drive specified. However I knew for a fact that the drivers were OK as other T470Ps were building fine. Transpires that somewhere along the way, something had indeed got mixed up on the disk and it was having problems with the config. I initially tried a DISKPART then CLEAN but this wasn’t enough and it was continuing to fail. Exit DISKPART and try again – this time the task sequence continued as expected. SCCM Current Branch – Updates and Servicing Pane Empty! So you’re looking forward to upgrading to the next CB version of SCCM and growing frustrated at the fact there is nothing appearing in Updates and Servicing pane. In fact, there should be several hotfixes showing in addition to the latest and greatest version of ConfigMgr. But….nothing. You can be logged in as a full administrator and nothing will appear! Open the console as the user which installed ConfigMgr in the first instance. 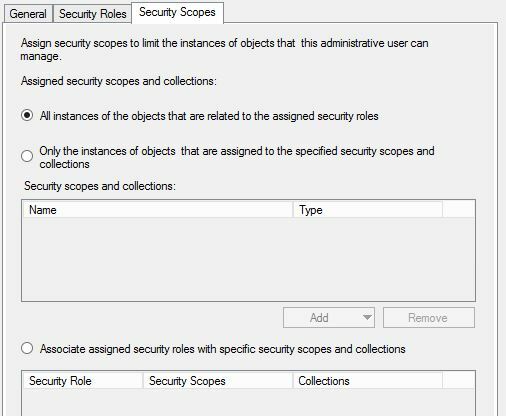 Failing this (user has since been deleted, etc) go to Administration | Security | Administrative Users and look for a user that has All instances of the objects that are related to the assigned security roles selected. The chances are, that the user you are having problems with doesn’t have this selected (yes, even if they’re a full admin) and this is the crux of the problem. Now, open the console with the user who has this permission and you should now get a message saying that there are updates available. Go to the security node and make the appropriate changes described above to the users or groups that you wish to have access to this view. There has been a lot of talk about the use of SQL AlwaysOn Availability Groups (AOAGs) from SCCM 2012 onward but it wasn’t available in any iteration of this version and promises were made by Microsoft to include this is as a feature in 1511. Indeed it seems to have been planned and implemented in the Technical Previews but evidently didn’t make it into the final official release of 1511. Given that officially* you need to go via 1511 to install 1602 this is very annoying for anyone wishing to use this feature as a number of extra steps are required. Below I try to clear up much of the contradictory information available at present (May 2016) on the internet. https://4sysops.com/archives/system-center-configuration-manager-2016-tp3/ which suggests it is available in TP3. Well that that clears it up then. After filtering through a good deal of contradictory information, it appears that SQL AOAGs made it into the 1512 TP4 version and that 1602 is the first official CB release to have full support. So to be clear, when installing 1602 and above from scratch, install 1511 first by pointing to the single DB instance then change to AOAGs later via the procedure below. * I hesitate to say this but it is perfectly possible to install 1602 direct from certain media sources** for 1602. This is not supported and therefore not recommended, I am informed one of the side effects of doing this is that you’ll not be able to update in future. There may be other, undocumented side effects too. ** Media I obtained came from an unconfirmed source although it is possible it may have been from CD.Latest (I didn’t originally source it so can’t confirm for definite). Basically don’t do it if you want a supported environment! 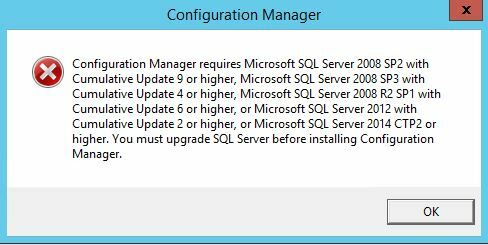 SCCM 2012 R2 SP1 with SCCM database on the same server. So in a lab I upgraded my SCCM 2012 R2 SP1 instance to 1511. This is a Hyper-V environment running on my Surface Pro and I have SCCM, SQL and the SCCM admin console running on the same VM. The upgrade itself appeared to go smoothly but when I opened the admin console I just got the grey screen telling me I was unable to connect and that I should check I had permissions and that the SMS provider was installed and available, etc. Obviously it was, it was on the same machine and I had been working with it 20 minutes beforehand. My immediate reaction was something had gone wrong with the DB upgrade. I hadn’t run the /TestDBUpgrade switch as this was very much a test environment and I didn’t have another server I could quickly and easily test it with. I did however take a snapshot and reverted back. A few tweaks here and there and a re-run of the upgrade produced the same result. Then I decided to test whether this was actually a problem with the installation or simply a problem with the console. I decided to try and build a machine off this install (PXE boot) and sure enough it built perfectly. Next, I installed the 1511 console on another VM (my lab DC in this case) and sure enough again, it connected perfectly. 2. LODCTR /R (ensure you are in the dir path above or you are likely to get error code 2). 3. Reinstall the console from the 1511 upgrade setup. 4. Et Voila, (hopefully) all should start working again.